Free Audio books! FREE AUDIOBOOKS! Who does not love free!? If you know me you know it is a very favorite way to be! Free! Today is exciting because it is only 5 days away from the first installment of 2 FREE AUDIOBOOKS to keep that are geared towards teens. Let us be honest. A guilty pleasure of my is YA (Young Adult) novels. These are a great treat that you get to keep courtesty of Sync. They have helped expand my audio books beyond what I typically am geared towards and allow me a wider range information that expand my horizons. How to save basil seeds. 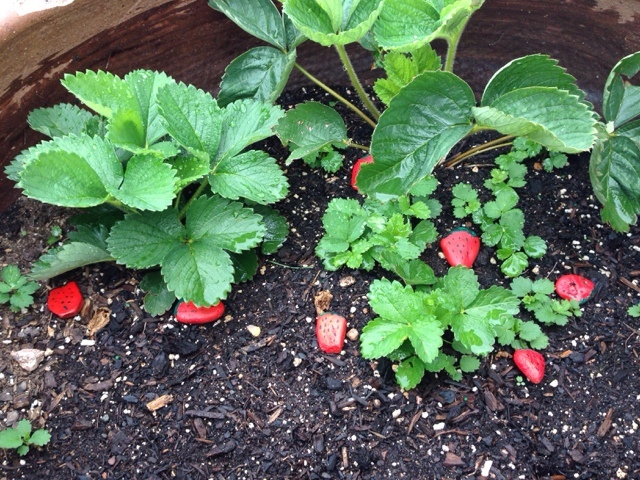 Homesteading in suburbia from seed to seed. Basil start to finish. 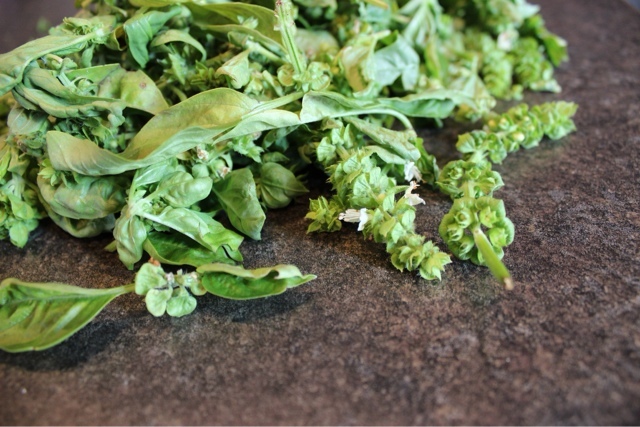 Most people take a leaf here and there from their basil. If they are ambitious pesto is in the cards. But the relationship ends there. This is year 4 of growing basil. Each year I have gotten more and more involved with the plant itself. Here is what I've learned. When your basil goes to flower, pinch it off. You want the resources of the plant to go into making new leaves not seeds and flowers. They will keep producing flowers and I just to through and pick them all again. When it flowers, some people loose interest in the plant at this point. Either letting it go calling it done or even ::gasp:: tossing the whole plant ! I'll admit I was tossing the flowers and seeds before. This year I'm really into drying herbs and saving seeds. Here's the trick. Dry everything for at least a week. It might have gone to two. Then just roll the bits you saved in your fingers. It crushes up the driers flower bits and the seeds come out! 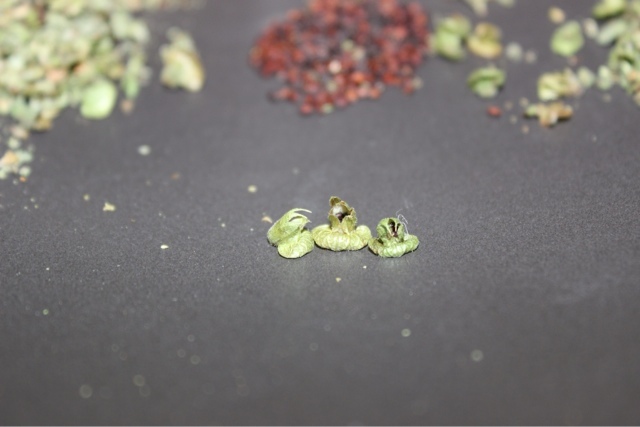 There are typically 4 seeds per pod and the pods looks like this on their own. You get really good at identifying the seed pods. They look like this. 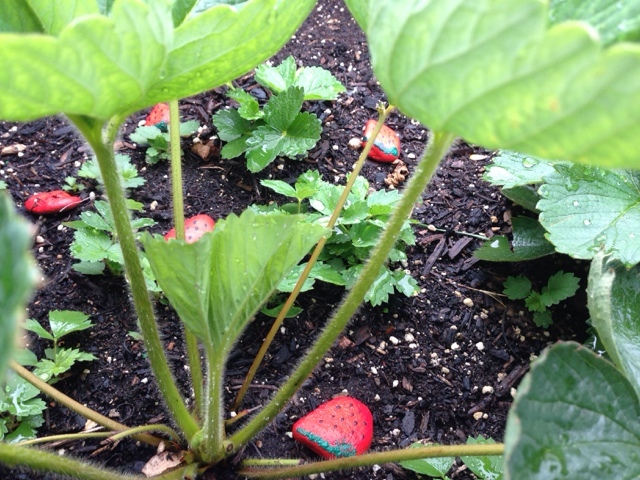 Typically found on the stem below the flowers (which are also edible) ! Fully dried and ready to store for next year ! I use an airtight little tiny jar then envelope them to protect from light deterioration. Handy to label year and plant origin! Any leaves that dried are saved for winter use and soups. 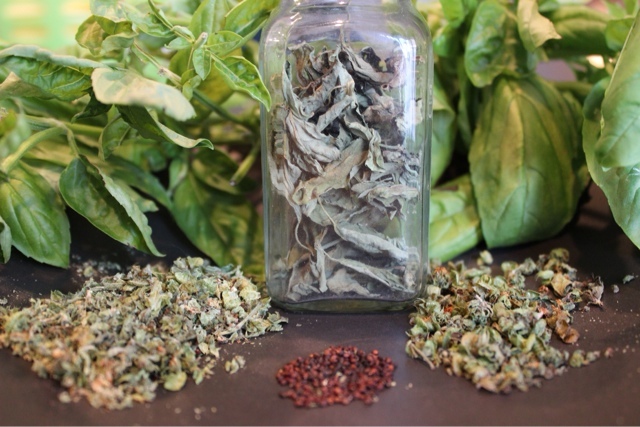 All the crushed up basil bits that came from harvesting seeds just went into the dried jar too for later use! Great flavor! It's obviously a time consuming and not at all "cost effecient" to the rich mans eyes. But not only is it free to save seeds but some day someone might control all the worlds seeds and have all of the fruit and produce "trademarked" and breed to have seeds that will not produce fruit. Even if that was not a worry, why not stockpile and ensure that you yourself have independence and a different gratitude for the food you create! 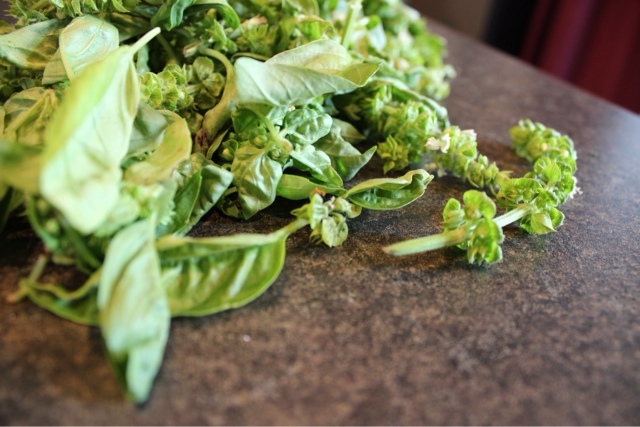 What are your favorite things to do with basil ? Hoping to dissuade the birdies and teach them our food is no good. I'll let you know how it ends up at the end of the season ! Chalkboard Craze! I absolutely LOVE the idea of making surfaces multi-purpose. On top of that there are also other benefits to having my measuring cups all have a home and always in an order. Baking is just that much more fun when I can leave my cabinet door open and have every spice and measuring cup at hand! The measurement conversions come in handy too! Most of the materials I already had on hand too! 1.) Get a slim piece of scrap wood to add to the middle of the inside of the door. I attached this using wood glue and used a heavy object to hold it in place overnight while the glue dried. TIP: Make sure that when you are opening and closing your cabinet door that the extra wood and what will be hanging off of them do not interfere with the existing interior shelves. 2.) Line up all of the utensils in the order you want them to hang. Using a Sharpie color in the holes to mark where you will be drilling. 3.) Pre-Drill the holes slightly smaller then the coffee cup hooks you will be screwing them into. Screw in cup hooks. 4.) Mask the edges of the wood you do NOT want paint on and then spray away! Following the instructions on the can, it is important to prep the chalkboard with chalk then erase once its dry. Voila ! And a Beautiful addition to our home! Though I do have to warn you... this cabinet door is noisy if you find you swing cabinet doors open fiercely. Which apparently I used to do but no longer as the clanking of Stainless Steel is enough to make me have a new softer approach ! 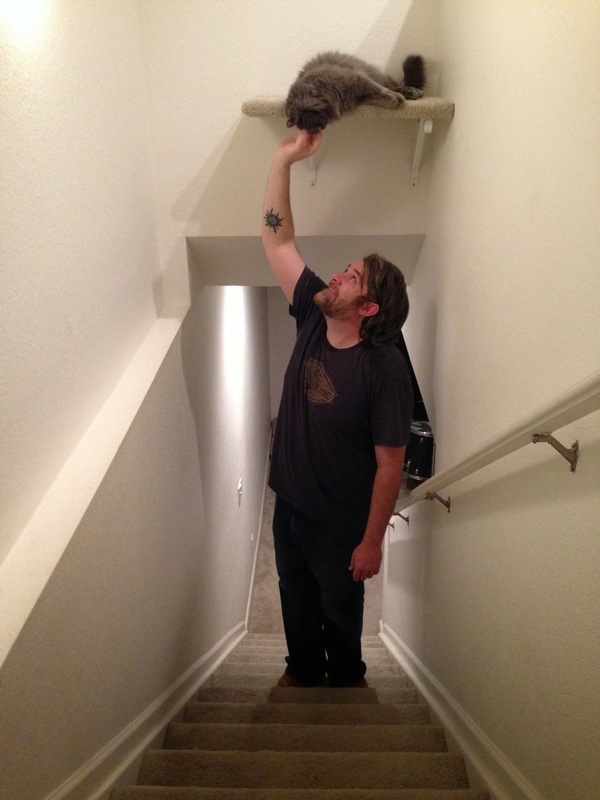 Yes we built a shelf for the cat. Just think of all the possibilities! One a little above you by the bed to keep them off you! An unused nook in the room you notice them in the most! We had all the supplies lying around. 2 metal braces we had up in our garage not doing anything and were there when we moved in. 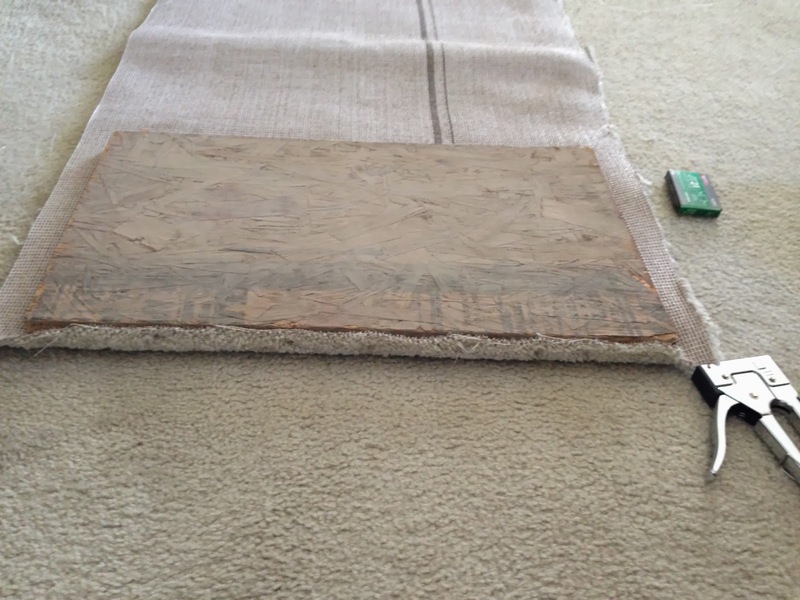 I am AWESOME at stapling carpet to the wood apparently. 1.) Make sure staples are all the way in. I pushed the carpet away and got in real close. Then if I felt it at all I Hammered it in. 2.) To get it tight around the corners I snipped away some of the carpet, stapled it and then did the actual wrap around and stapled some more and more and more and more. Remember the kitties have claws and like to use them. 3.) If you can use a stud, DO! Kitties jump and I like the idea of it NOT EVER ripping out of the wall. 4.) How to find a Stud the easy way. Take the strongest magnet you have. Run it up and down the wall till it sticks. That means its a nail and that means its a stud so you know its running up and down from there. 5.) 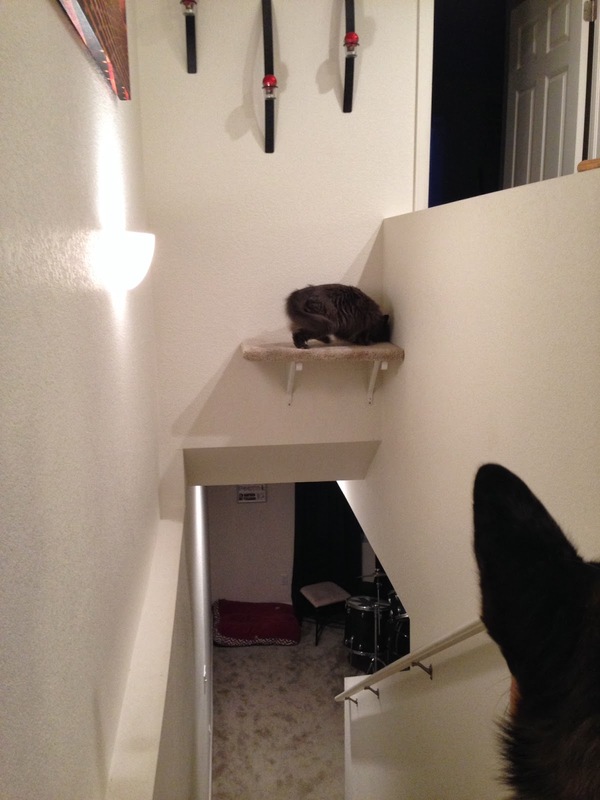 Use a corner to stick the cat shelf in. That way there is a place for curling up in. See the dog trying to figure out how to get there! 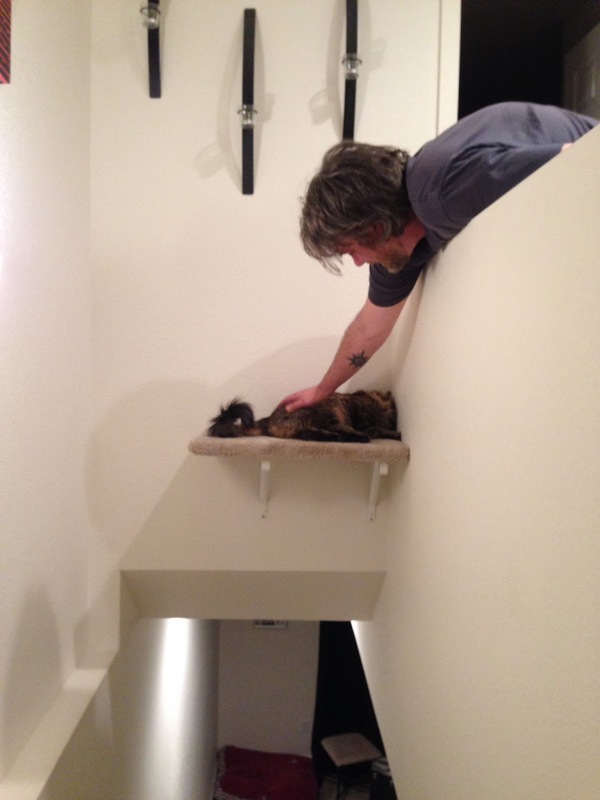 Yes we have now made a Kittie Highway for the stairway. “This is too nice to throw away.” That’s our phrase. And a lot of things really are, or take up microscopic space like this next project ! We live in new construction suburbia. Lots of old school “door to door” sales men. The one’s that I enjoy are the ones that just leave their flyers. Some have gotten smart and leave a magnet on your garage door. This company that was promoting their services gave me the inspiration to tear off the sticker. 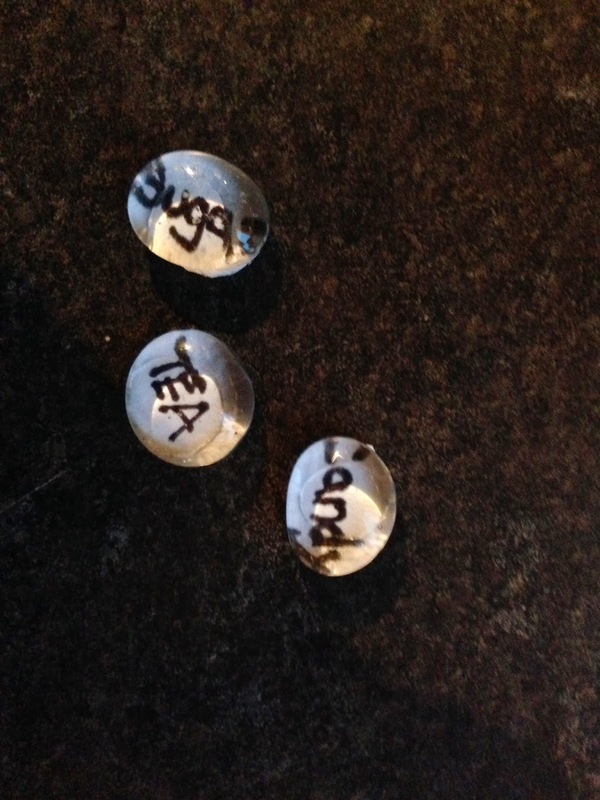 Use it as a Label and Magnify that with these flat glass marbles or gems. Imagination of what you want to "magnify"
These magnets are so easy to cut up into any shape and size ! 1.) Write directly on the white! 4.) Hot Glue word side on bottom of the gem. 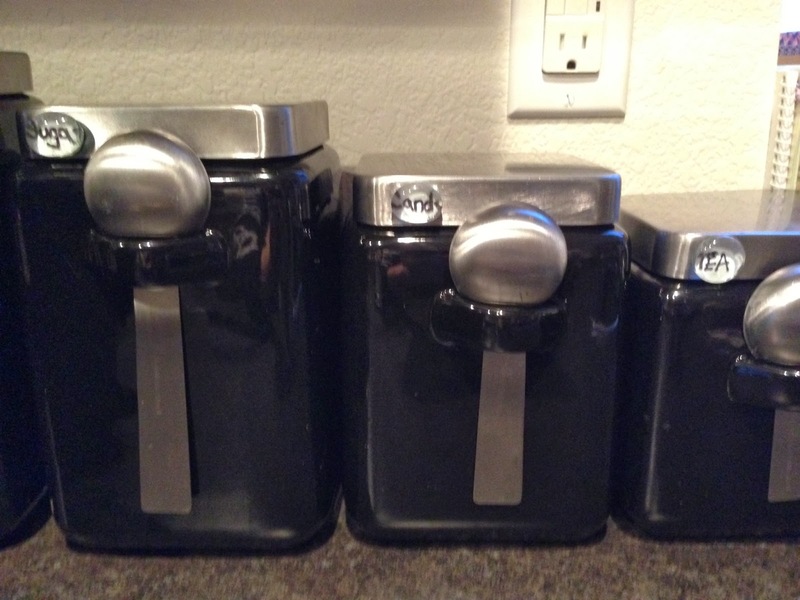 Used here to label the steel lids of my canisters on my island! Our cost : Free ?! Ok so the supplies are usually already in your home. If not, the amount I used versus the amount this stuff costs equaled about .18 cents. Optional: Straw or something to poke out hole for string and cookie cutters to make a shape around the impression. 1: Mix all ingredients in a sauce pan. Stir consistently over low heat. About five mins in mine started clumping so we mixed faster. At about ten mins in it started thickening up. Almost feeling like glue. Once it's so thick it's difficult to bring your spoon through take it off the heat and let cool for a few mins or until it's cool to the touch. It took us 15 mins of stirring over low heat to get to that point. Cook yours out longer ours was not even close and could have been less sticky. I tired rolling it before it was all cooled and it didn't want to do that. Just kept sticking. So be patient and wait until it is not sticky. Mine may have wanted to be over heat longer. It's still sticky to the touch. 4.5: Embellish the print (if you couldn't get a deep enough impression. We were gentle because I wanted to be able to wipe it off the animals easy. Tip: Have a wet warm soapy rag on hand). We used a chopstick. Then the weekend ended. Allowing the imprints to dry thoroughly for a whole week. (really only recommended 24 hours but things got busy). Advice: Really really cook out all the moisture you possibly can. make it so very difficult for you to drag that spoon through. It's a weird liquid / solid gak type substance ( delicious in my beef and broccoli, I swear secret ingredient type stuff). 6: Paint! Some cracks started showing so first coat of paint I recommend is a white latex paint. After that dried we then decorated. Painters Tip: Wait until the first two contrasting colors dry before painting any trim or embellishments for best results. Hi! 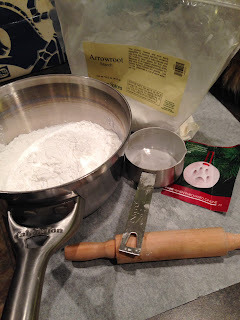 Welcome to my Homesteading in Suburbia blog! If you have come far enough to read this then this is going to be about everything from crafts, my home, family, food inspiration and anything else I come up with. Why not make the dream of living off grid in the mountains more tangible by learning all of the skills I will need, here in my beautiful home.